Finding a laptop fit for students as well as adults is not an easy challenge. Thankfully Lenovo decided to step in and ease the burden with its third generation Lenovo Thinkpad 11E-G3 netbook. This particular netbook has made a name for itself thanks to its ample SSD storage, 8 GB of RAM and ultra resistant body. Today we're ready to know everything there is to know about this model and invite you to do the same in our review of the Lenovo Thinkpad 11E-G3 3rd generation. The Good: 8GB of RAM, 128GB of SSD storage, lightweight design, extensive battery life, excellent price/spec relationship. The Bad: No DVD drive, not suited for gaming. 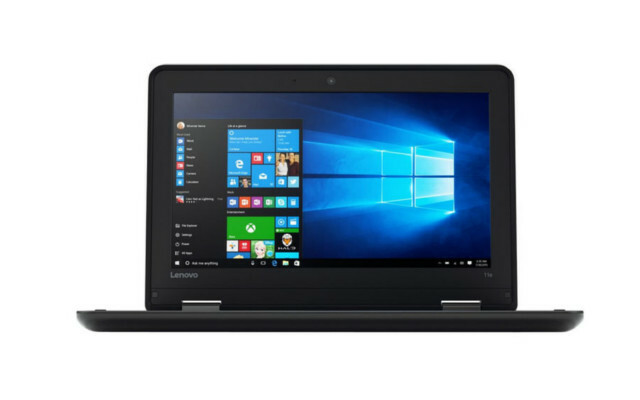 While the Lenovo Thinkpad 11E-G3's design isn't going to win any awards anytime soon as far as premium laptop design goes, this laptop was designed from the get go to be both very portable and very durable. The 11E (model 20GB000LUS) comes with a rubber bumper along the top cover to reduce impact and the corners are also 50% stronger to protect the laptop against falls from an angle. All in all, while not an indestructible netbook, this particular model can withstand falls of up to 90 cm, which is coincidentally the average height of a desk. Despite all the work around making the 11E especially resistant, it's not particularly heavy, weighing in just above 3 pounds, among the average numbers we find in laptops this size. Speaking of the size, it features an 11.6 inch LED display with anti-glare technology and your standard 1366 by 768 pixel resolution. Surely you didn't tag along to read this review because of the Lenovo Thinkpad 11E's outstanding design. No, you came here to know if it's packing what you need to get your job done. To that point we've got an Intel Celeron N3050 CPU with two cores, 2 MB of cache and a base speed of 1.6 GHz (2.16 GHz on Turboboost). This is a fine CPU that can work for a variety of things from running virtual machines to editing the odd summer picture here and there. It goes without saying that it's more than suited for basic tasks like surfing the web and watching movies as well as editing spreadsheets. However, the most interesting thing about this laptop isn't its entry level processor but rather its 8 GB of RAM which will allow you to multitask like there's no tomorrow. You'll be able to run several resource hungry apps as well as have dozens of tabs open in your browser at the same time, providing therefore a seamless experience that doesn't trouble you with freezing apps or the much feared blue screen. Another huge advantage to the third generation 11E thinkpad is its storage, which is a single 128 GB SSD storage unit. Believe me, if you come from using standard hard drives as storage then you'll definitely notice the speed bump that an SSD will provide you with. Apps open faster, the entire system loads in seconds and boot down times are also considerably lower even if you where running several apps at the time of shutting down the laptop. What's the word on gaming? Games are not something Lenovo had in mind when designing this beauty. However, thanks to its integrated graphics chip you can expect decent frame rates on low settings with some old titles such as Sims 4 or the more sportive Fifa 14. That said, this laptop isn't aimed at being a gaming laptop and therefore we wouldn't really go beyond casual gaming with this one, and that's in a good case scenario. Battery life is another major advantage since this laptop can deal with up to 12 hours of unplugged pleasure. However, you should notice that I said "up to" which typically means that you should shoot down your expectations a bit and even if that were so and we went down to a more realistic 8 hours, that's still above average in this price range. Finally, the ports available on this netbook are two USB 3.0 ports, an HDMI output, SD card reader and a rather unusual ethernet port. We say unusual because despite being very common amongst 15 inch laptops, an ethernet port is extremely rare in smaller form factors. Obviously, due to size restrictions there's no DVD tray but that's something we can live with. Upon wrapping up this review of the Lenovo Thinkpad 11E-G3 (model 20GB000LUS) we've gotta say we're very, very impressed with how much Lenovo was capable of delivering on such a small form factor and at such a competitive price point. It is, without a doubt, one of the best student laptops in terms of price/spec ratio. The SSD storage and 8GB of RAM are pretty much unheard off on a laptop in this category and the extensive battery life coupled with a pretty good processor have won us over. Sure, the design could use some work but it's this particular design that will protect this netbook against any falls or impacts, when you consider that and the fact that this is not exclusively a "kids laptop" you're looking at a pretty impressive machine that won't take long before it rules the best sellers list across the market.